Another big first for an Apple product is the inclusion of a USB Type-C connector. The connector has been in development by the USB Implementers Forum for some time, and was finalized by the group in August of last year. The Type-C connector is intended to serve multiple purposes for the USB-IF and device makers such as Apple. Functionally it is the next-generation connector for USB, designed to replace the various sizes of USB Type-A and Type-B connectors that have been with us for nearly 20 years. In updating their connector, the USB-IF has focused on correcting flaws (perceived or otherwise) in their existing connectors while laying down the groundwork for the next 20 years by adding pins and features such as USB Alternate Modes. But before I get too far ahead of myself, we should probably start with the biggest reasons for Type-C, and it’s only fitting that for a thin & light device like the MacBook these are about going small. 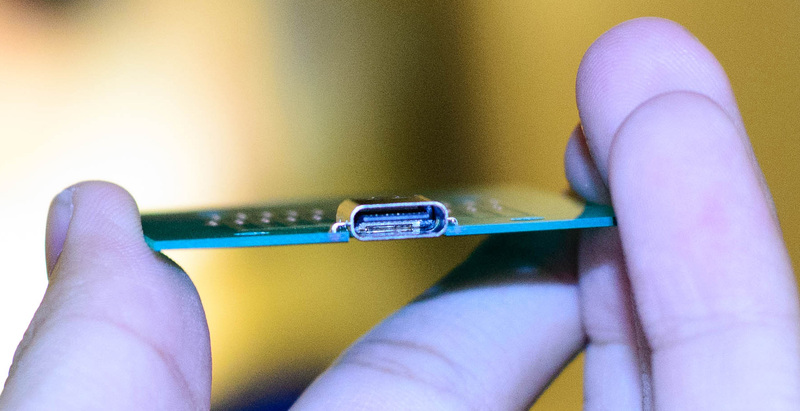 The Type-C connector is both smaller than USB 3.0 connectors (even Micro-B) and for the first time in a USB connector it’s symmetrical and reversible. 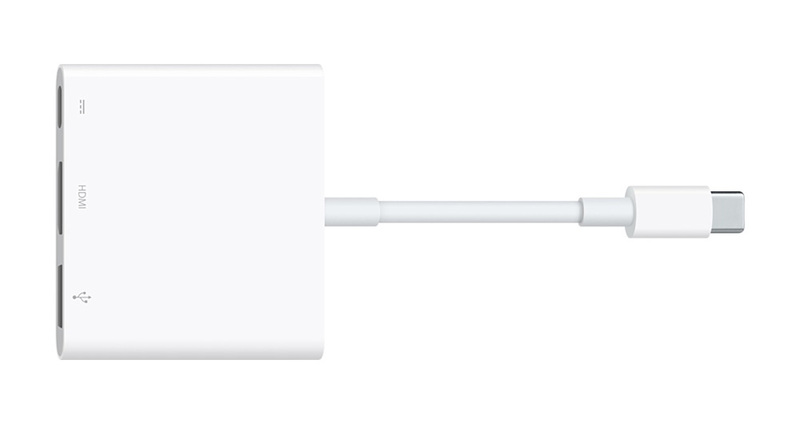 With an end goal of developing an Apple Lightning-like connector (and as Apple likes to remind everyone, they serve on the USB-IF as well), the USB Type-C connector comes on to the market as the universal version of that connector, designed to drive data, power, and even displays. In conjunction with defining the new connector and cable standards, Type-C also goes hand-in-hand with defining new features, the USB Power Delivery Specification and the USB Alternate Modes specification. Though to be clear these are optional specifications don’t apply to all Type-C devices (the Type-C can be used with even USB 2.0 devices), they do apply to the MacBook, where they drive additional functionality. The Power Delivery specification defines how much greater amounts of power – up to 100W – can be carried over a USB cable, allowing for USB cables to charge tablets, and yes, even laptops as in the case of the MacBook. 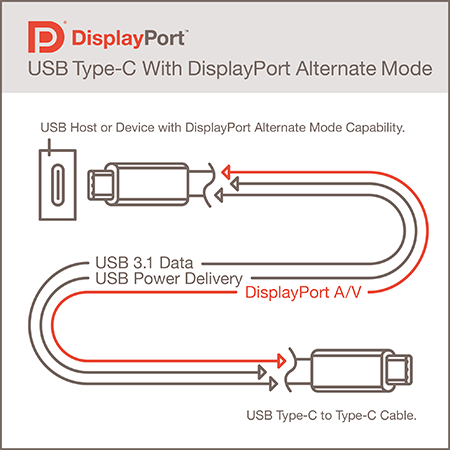 Meanwhile the Alternate Modes specification defines how other protocols can be carried over the cable in place of some of its USB 3.0 “Superspeed” functionality, the most important of which is DisplayPort video. All of these features are tapped for the MacBook, and as a result the Type-C port is the do-everything port for the MacBook. It’s through the Type-C port that the MacBook is charged, it’s through the Type-C port that USB devices such as flash drives and Ethernet adapters are attached, and it’s through the Type-C port that DisplayPort video is carried out of the MacBook to external displays. USB Type-C will be the future of USB, and ultimately we would expect to see all devices replace their Type-A/B connectors with Type-C in the long run. But for the moment the MacBook is among the first devices that features Type-C, which means it’s on the bleeding edge for all the benefits and drawbacks. From a feature standpoint Type-C works well, but until it’s well established there will be confusion over the standard, particularly over the interaction between Type-C and USB 3.1. Case in point: as per the USB 3.1 standard, Apple officially classifies the MacBook as a USB 3.1 Gen 1 device. What is USB 3.1 Gen 1? The answer is that it’s really USB 3.0, with the USB 3.1 standard having adopted USB 3.0 and given it a new name. In this case Apple is using Core M’s built-in USB 3.0 controller to drive their Type-C port, and that means it has the same bandwidth capabilities as any other USB 3.0 port, meaning 5Gbps “Superspeed” capabilities. USB 10Gbps “Superspeed+” on the other hand, which is already commonly known as USB 3.1, is actually called USB 3.1 Gen 2, and is just now appearing on the market in other devices. At this time Gen 2 requires separate controllers – no chipset has built-in support – and given the design goals of the MacBook it comes as no surprise that Apple has minimized their use of separate controllers in order to save power and space. In any case, while the MacBook doesn’t support 10Gbps USB, it does support all of the other major features, and it is for the most part awesome. Jokes about USB Type-A superposition aside, the Type-C connector is a clear improvement over Type-A for anyone that has ever struggled with getting a device plugged in the first place. Either way is the right way, making it far, far easier to plug in new devices. Meanwhile the new connector is only marginally wider than Apple’s Lightning connector, so while we don’t have a ton of space-constrained devices with Type-C so far other than the MacBook, it’s similarly an improvement over USB 2.0 (and especially USB 3.0) Micro-B. In terms of mechanical design there’s really nothing bad I can say about USB Type-C; in the long run this is a much better connector than Type-A. Short-term however there are definite teething issues. Primarily due to the fact that almost no peripherals support Type-C yet other than Apple’s included charger, for most anything else you will need to use a Type-A to Type-C adapter, which Apple sells for $20 but does not include with the laptop. The adapter will allow you to plug in typical USB peripherals and even supports USB 3.0/USB 3.1 Gen 1 speeds, but it’s a definite oversight/stinginess on Apple’s part right now to not include it given the lack of compatible peripherals. 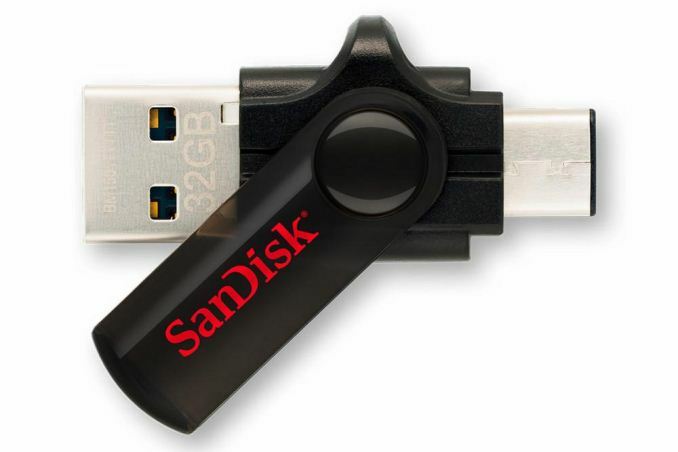 Longer term this won’t be a problem, SanDisk for example already has a Type-C flash drive on its way, but for the moment MacBook owners will want the adapter. Moving on, using USB Type-C as the means to charge the MacBook is not unexpected given the standard’s new capabilities. Apple’s included 29W charger can deliver 2A @ 14.5V for devices that comply with the USB power delivery specification, and 2.4A @ 5.2V for older USB battery charging devices (phones, tablets, etc). 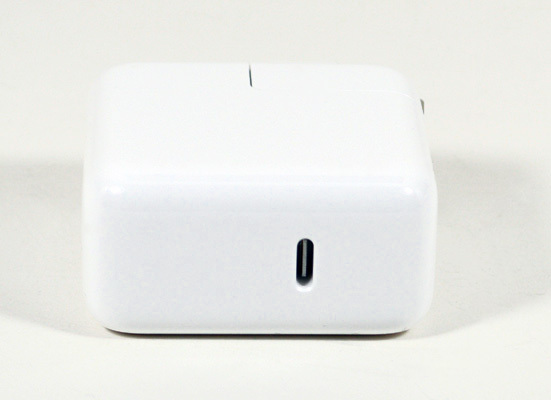 Conceptually this means that Apple’s power adapters are no longer proprietary, and the MacBook should be able to accept other chargers that deliver the required amount of power while Apple’s charger can charge similar devices. The catch is that this means Apple has given up their nifty MagSafe technology in the process. Apple’s magnetic connector has already gone through one shrink and would have needed to go through another shrink for the MacBook – and I’m not entirely sure whether Apple could pull it off – so instead we have the non-magnetic USB Type-C connector. Given the safety aspects of MagSafe I’m sad to see it go, as it has likely saved my MacBook Pro once before. Meanwhile in controlled testing I’m finding that the Type-C connector can take quite a force before coming free of the MacBook, which for a USB peripheral is undoubtedly a good thing, but it’s definitely going to be possible to drag a light laptop like the MacBook off of a cable via the Type-C connector. 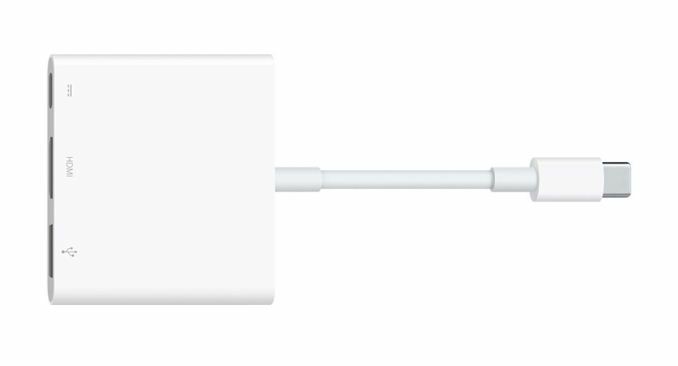 I don’t imagine Apple had too many other choices here, but MagSafe will be missed. Along with power and data, the Type-C connector also carries video via the DisplayPort signaling standard, and I had a chance to try this out as well. 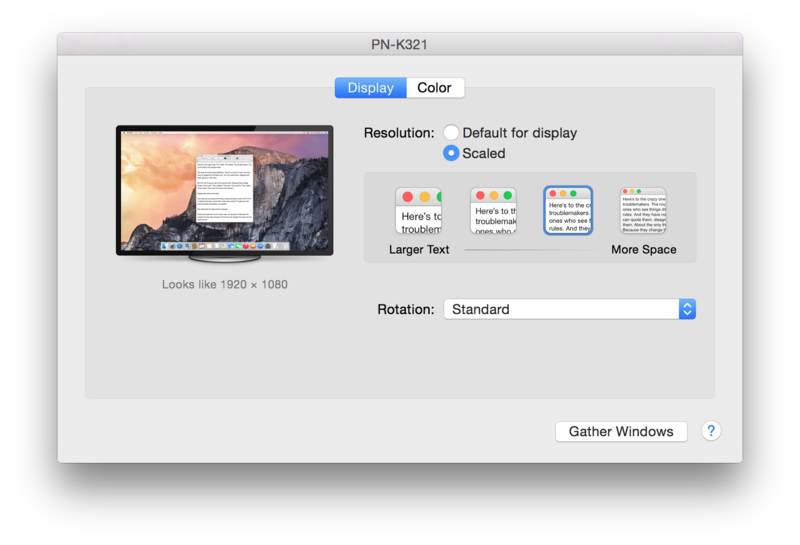 Using one of Google’s USB Type-C to DisplayPort cables, I was able to connect the MacBook to my Sharp PN-K321 32” 4K display with mostly positive results. In Single Stream Transport (SST) mode, which for the Sharp allows up to 4K@30Hz, I had no problem driving the Sharp monitor at various resolutions up to its maximum for that mode. However when switching the monitor over to Multi-Stream Transport (MST) for 4K@60Hz, the MacBook flat out did not detect the monitor. At this point I have not had a chance to try a 4K@60Hz SST monitor, so I’m unsure whether this is a specific MST incompatibility, cable incompatibility, or if the MacBook doesn’t support 4K@60Hz (Apple for their part does not specify). Given the lack of detection I’m wondering whether Apple only supports up to 2 lanes of DisplayPort (4 are needed for 4K@60Hz), but without further confirmation that’s just a guess. Regardless a low-power device like the MacBook is not a great candidate for driving a 4K@60Hz display, but for the moment we can only confirm the MacBook works with displays up to 4K@30Hz. Last but certainly not least when it comes to the MacBook’s USB connectivity is the elephant in the room, which is the number of USB ports. As we mentioned in our look at the MacBook’s overall design, the laptop only ships with a single Type-C port, and that’s it. The only other port on the MacBook is a 3.5mm audio jack, which means the sole Type-C port is only the only port for power, for data, and for external displays. The issue, quite simply put, is that without external adapters you cannot charge the MacBook and use USB peripherals or external display at the same time. Want to install Boot Camp? You’ll need to do so on battery power. An external display? Same story. Apple has slowly whittled down the number of connectors they feature over time – the MacBook Air 11” ships with just 2 USB ports, a Thunderbolt 2 port, and a MagSafe port – but the MacBook is alone in only featuring a single data/display/power port. Well that isn’t entirely true. Apple does make one other device like that, and that’s their iOS devices. From a physical standpoint I question whether Apple would even be able to attach another Type-C port (likely not without reducing the curve or making the device thicker), but from a design standpoint I get the distinct impression that the use cases Apple is envisioning are very iPad-like, where a device is taken out for the day on battery power, any data connectivity is done over WiFi, and at the end of the day it is brought back home to charge overnight. Apple has always aimed for the cutting edge in this respect, and while I get where they’re going here, it’s difficult to agree with their design decision. The MacBook is still first and foremost a laptop despite its crossover design, and laptops continue to be used with peripherals. Ethernet adapters, USB flash drives, and mobile devices such as phones and tablets are not going away any time soon, and all of these devices are things you may want to attach to the MacBook, and probably while charging said MacBook too. The good news is that Apple does sell Type-C multiport adapters that serve as a breakout box for more ports – Type-C for power, USB 3.1 Gen 1 Type-A for peripherals, and HDMI 1.4 for video out – but of course this is an additional $79 cost and is one more item to carry around. Right now I’m of the opinion that Apple should have shipped the MacBook with 2 Type-C ports (and without replacing the 3.5mm audio jack), primarily to allow the device to be charged and used with a peripheral without requiring additional adapters. To be sure the MacBook is easy to get along with most of the time, and in most cases it’s not a problem to stop charging it for a bit to use a peripheral, but we’re not quite at the point where a single port is always going to be sufficient. In the meantime I will also fully admit that there are technical issues with multiple ports – how do you route power and video now that it can come in and out of multiple ports – but these are issues I’m confident Apple could resolve.